For many years, the story of how Abner Doubleday created baseball in Cooperstown, New York in 1839 was repeated as fact. But it has now been safely established that Doubleday was not even in Cooperstown at the time and he likely never had anything to do with baseball or its origins. Here in the natural state, a somewhat similar baseball legend has arisen. It has been repeated on the internet and elsewhere that Albert Pike, whose name remains well known throughout Arkansas and the whole country, played in and was perhaps even the losing pitcher of the first ever baseball game played in Arkansas on May 11th, 1867. But is there is any merit to this impressive claim? Albert Pike was born in 1809 at Boston, Massachusetts, but moved to Arkansas in 1833 after traveling around the southwest working as a trapper. He became well known as a newspaper editor, poet, attorney, and military leader during both the Mexican-American and the Civil wars Today, Pike is best remembered as one of the most mysterious and influential Freemasons in American history. From February 1867 to September 1868, Pike worked as editor of the Memphis Daily Appeal, a well-known paper and predecessor to what is now The Commercial Appeal. 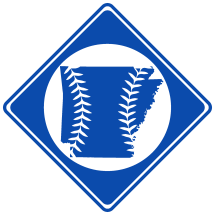 It was during this time that the first recorded game of baseball in Arkansas was reported in a Little Rock paper, the Arkansas Gazette Weekly. Among those who played in the game was a centerfielder listed as ‘Pike’ with no first name mentioned. Albert Pike, therefore, could not have been the losing pitcher, and the chance that he was indeed the player listed at all is very small. Pike was 57 at the time, overweight and living 125 miles away in Memphis. These things diminish virtually any likelihood that the story is true. Like the Abner Doubleday version of baseball’s creation and other parts of early baseball history, the tall tale of Albert Pike’s encounter with baseball should be classified under the category of legend rather than fact.